Colette Owens is the Executive Director of Hiawatha Academies. During the Fellowship, she served as Director of Academic Strategy and Special Projects for St. Louis Public Schools. In that role, Colette was responsible for the implementation of a performance-based data system to drive school improvement efforts, coordinates cross team collaboration, and manages state and federal programs. Prior to this role, Colette served as a Managing Director of Teacher Leadership Development for Teach For America in St. Louis, MO. In that role, Colette led a teacher leadership development team which significantly impacted student growth during the 2013-14 school year to an average of 1.5 years of student academic growth across all corps member classrooms and an average increase of 32 points across corps culture metrics. 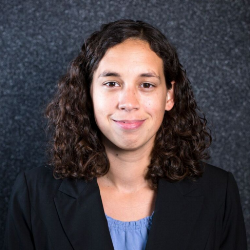 Before joining the staff at Teach For America - St. Louis, Colette served as a Special Education Team Leader and school improvement team member at Long Middle Community Education Center for St. Louis Public Schools. Colette holds an M.A. in Teaching Special Education from Webster University and a B.A. in Psychology, Neuroscience, and Philosophy from Washington University in St. Louis.